So Nate slept through Halloween night. We went to Gigi's house (sans costume) and he hit up a few houses with his cousin Stone early in the evening. After that, our plans collapsed as he CRASHED OUT in the car around 6. We thought about waking him but he was exhausted from the weekend and hadn't a nap so we let him sleep. He made it all the way until morning so I'm glad we did. He must have needed it. The scarf and the glasses both received a "No Thank you Mommy" when we attempted to put them on. I even attempted bribing him with candy. We figured a lot of people wouldn't get it anyway so we just let him run around in his normal clothes. No one seemed to mind. I guess he can dress up next year if he wants. It was one of those battles that just wasn't worth the fight. Me: These skinny jeans are maybe the cutest thing ever. Her: I know! My niece has three pairs. Me: They're for my little boy. I fully support the phenomenon for both sexes. Karl refuses to wear them but even he admitted they looked cute on our tall and skinny child. Plus, they are one of the few pairs of 2T pants that don't fall off his skinny little waist. 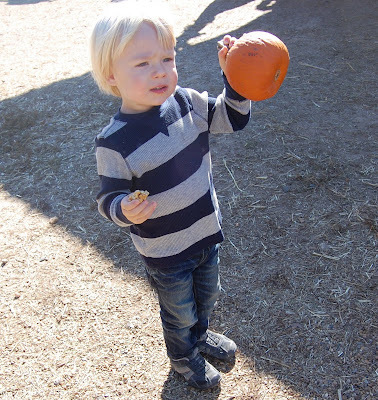 Pumpkin Patch pictures to follow. The hipster idea was great! I LOVE the skinny jeans! Adorable. Really, that's the only reason why I want kids. I want a name as cool as Stone! Also, I want baby skinny jeans for Henry because his chubby short legs would be TOO DIE FOR in them. Great Halloween costume idea, btw. he looks mega cute in those jeans, for real. and you are adorable as well! I LOVE the skinny jeans. and you. that is all.